Having rushed out of London to Birmingham and back at 5am for a 14 hour round trip to see the woman who struck me down with a car four years ago, we were somewhat short of last minute dinner options near our hotel. As lovely as Hammersmith is, it is woefully short of somewhere to eat on a Monday; L’Amorosa is closed, as is the Indian our hotel tried to send us to. We settle for Honest Burger, a small chain of bits of beef between buns beloved of belligerent Londoners. And before those Londoners get shouty for calling them belligerent, yes you bloody are. I’ve travelled on the tube at peak times, I have the footprints on my back to prove it. They have a nice queuing system that allows us to wait in the pub around the corner until a table becomes available. 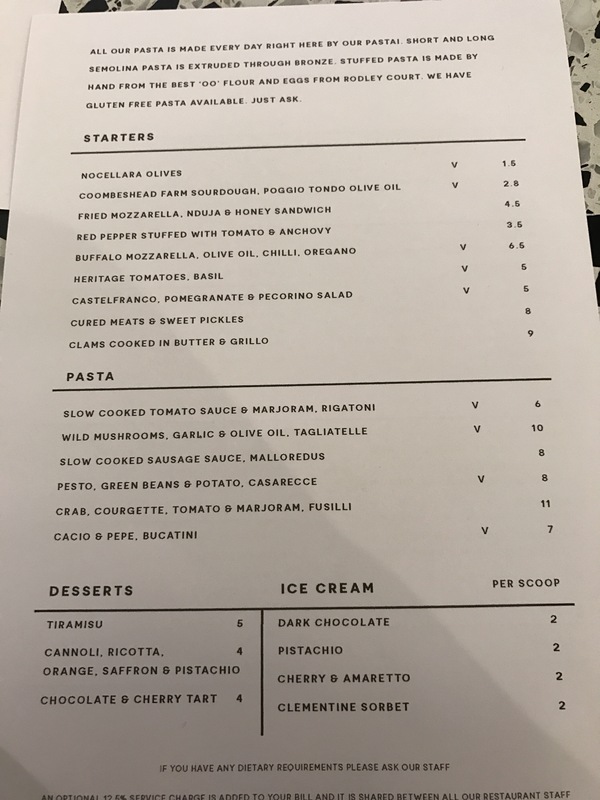 When one does we are sat upstairs underneath the shadow of the blackboard that is the menu for those with the vision of a mole. We order cocktails in tin cups and bottles of local beer. We get two beef burgers and some bits to ensure we leave full. The beef is served pink they say to which we say fine. Its a solid start for somewhere that charges a little over £40 for burgers and drinks for two. And then, well, meh. The burgers are boring to the point that they serve to remind me why I quit eating them for a while. The patty is pink but it is also bland, the bun hardly holding its shape. If this was In and Out the emphasis would be on the final word. It’s Five Why’s. Shake Whack. The jalapeño relish and hot sauce one is only distinguishable from the garlic mayo one by levels of attitude. Both have bacon; one crisp, the other not. I get a ribbon of raw fat wedged between my teeth. The rest is a mixed bag. We get the Paris Hilton of onion rings; they look alright until we get into the doughy interior. The chips, often the bane of the burger shop, are properly good and dusted with rosemary salt. The best bit is the curry sauce that tastes better than my local Indian takeaway. It’s just when the best bit makes up one fortieth of the bill you know there is an intrinsic problem. Service was ponderous, the bill painful. I could think of half a dozen burger places I would rather eat at for less. And tragically this isn’t the first time this has happened to me in the capital; Bleecker aside I’ve tried little to get me excited. I’ll never have a burger again here. Honest. I read a lot of other blogs and a lot of lists. I’m fun like that. Almost always food, always a mixture of the good and the bad; there are those I look up to and those I read to make myself feel better. It’s important to keep your eyes on both the sky and the dirt. One of the things I read a lot about is burgers. Outside of Brum I know about as much about them as I do monogamy and modesty, but my girlfriend loves them so it’s in my interest to keep her happy. I’d have never had found out about Bleecker without reading other blog posts, and those same posts always list MEATliquor (and it’s offshoots for which Covent Gardens MEATmarket is one) as one of the true originals to the burger scene in this country. So I’m not quite sure what has happened. Maybe the very businesses that they have inspired have surpassed them in quality and delivery. Maybe there offering isn’t as good as it used to be. Maybe it was actually never that good. I don’t know, I can only base it what we had, and what we had was okay. The burger that I see on most lists is the Dead Hippie, a double patty of just pink beef in slender proportions with their famous Dead Hippie sauce that is seemingly a mustard mayo given a kick up the arse with chopped pickles and Worcestershire sauce. It’s messy and difficult to hold (these are plus points, honestly), with a bun that gets too soggy too quickly. The beef is good, but not up there with the best; it’s a little chewy in parts and we chow down on bits that possibly shouldn’t have made the cut. The sauce adds a nice acidity and the diced onions are welcome. It’s a good burger, I’ve just had much better. The double bacon cheeseburger baffles me for crimes against bacon. We’re back on that double patty and bun though this time with additional thin layers of something dark brown that tastes vaguely of pig. It’s bacon, minced and reformed again, because, y’know, sometimes a rasher just isn’t good enough. They’ve destroyed the essence of what it should be, the fat content and the crisp shard of pure pork flavour, turning it into a just another layer of something brown and grainy that detracts away from a pretty good burger. We switch our attention to battered fillets of chicken breast that give the impression the oil was not hot enough. The batter is flaccid in good places, soggy in others from a coating of buffalo sauce. It makes a bit more sense when dipped into the blue cheese dip. There is a revelation in the form of a Hot Mess, cylinders of crisp potato that ooze a pungent blue cheese and jalapeno sauce, and less of one with green chilli fries that blast heat with every mouthful. It’s a credit to MEATliquor that the sides are genuinely interesting and I’ve seen very similar options pop up elsewhere, including Birmingham, in a blatant bit of plagiarism. The bill for all of the above and a couple of soft drinks came in at a few pence under forty quid, which would have been value had we enjoyed lunch. The truth is we both walked away full but underwhelmed, struggling to see what all the fuss is about. I can think of three burgers I’d rather eat in Birmingham and at least another three in London. The burgers at MEATmarket may be of legend, but the competition has not only caught up, but surpassed them. Not so long ago I was asked for the best Italian restaurant in Birmingham. “There isn’t one”, I said. “Pick another cuisine or go to London”. Whilst harsh, I stand by what I said. 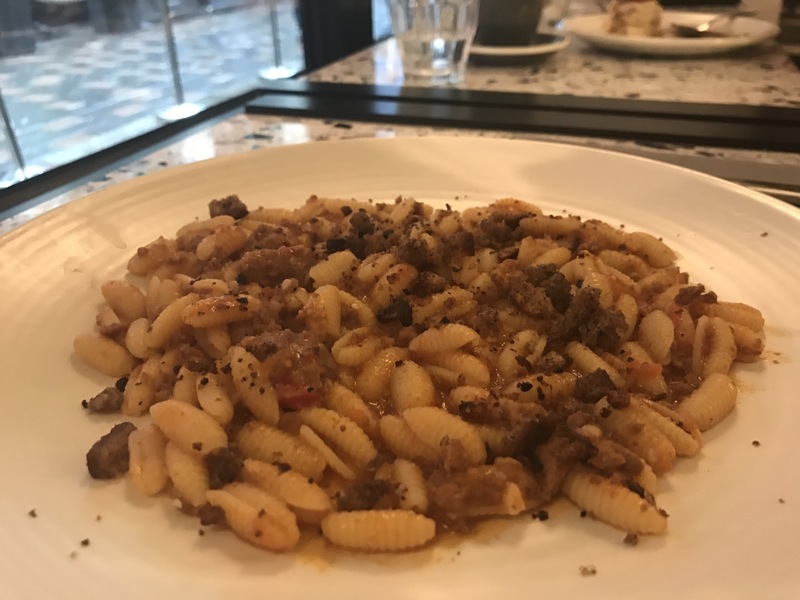 Our best Italian restaurants are universally average and I would argue that the food coming out of my kitchen is a damm sight better than the majority of theirs. Give me notice and I’ll braise down some ox cheeks and use the liquor to transform them into a ragu of rich meat. Expect this with homemade tagliatelle and a dusting of aged parmasen. Good Italian cooking isn’t difficult – I can do it, for Christs sake – we’ve just anglicised it to the point of pure laziness. I have places that I go to for fresh pasta, places that I’m not going to publicise because the queues are large enough already. 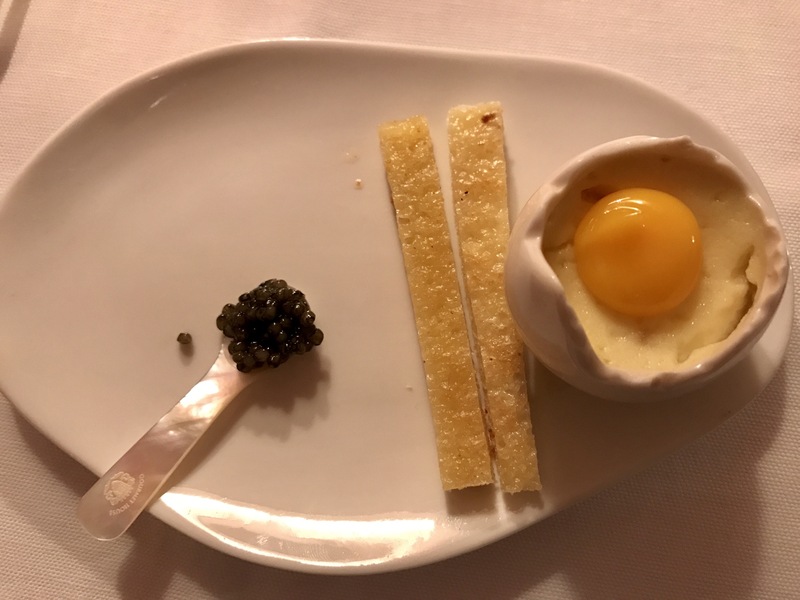 And then I see a tweet from Nigella Lawson of a potato ravioli with gravy, an oozing egg yolk and white truffle. Take me there and invite Lawson to bring the party whilst you’re at it. As soon we get off the train it’s straight over to Pastaio where a fifteen minute wait has us seated in the week old restaurant. We try four dishes which is enough to make me want to come back, but possibly not in a mad rush anytime soon. The biggest dissapointment is first; a toastie of sorts with mozzarella, honey, and n’duja. I note the n’duja last because this is barely present – the tiniest of blobs that sits off centre. I’d imagine in it’s full glory this is a dish to savour, just not today. Pasta is why we are here and that is obviously where their heart lies. 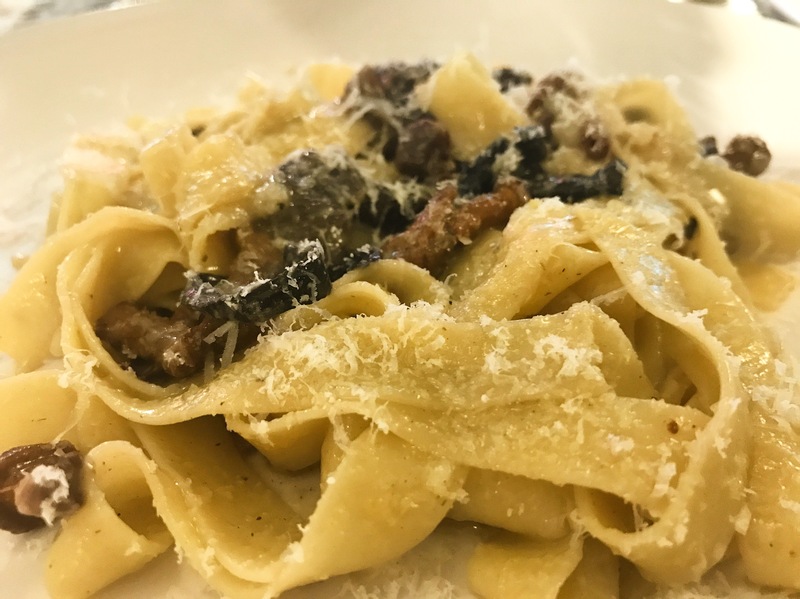 With no ravioli and gravy party we plump for wild mushroom tagliatelle. The pasta is silky smooth, the mushrooms delicately cooked with garlic. It’s a joy. Diminutive shells of malloredus pocket a ragu of sausage meat. It’s a grower of a dish, one that I end up clearing despite not enjoying the chewy croutons that work the jaw. 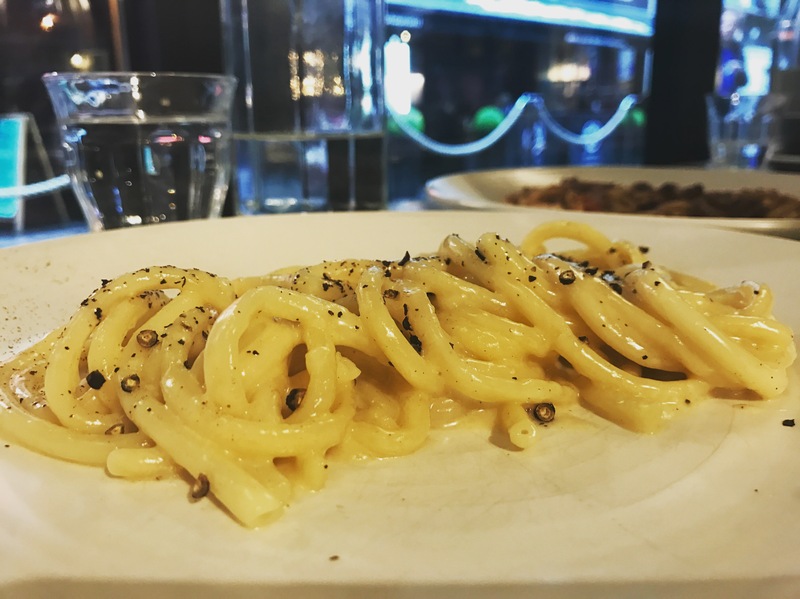 The day belongs to cacio and pepe and bucatini – a 2017 pasta dish if there ever were one. The thick pasta coated in a sauce of parmesan, butter and toasted peppercorns. It’s decadent and brilliantly judged, the ultimate in comfort food. With dinner booked for two hours later, we opt against dessert, despite developing envy from the neighbouring tables tiramisu. 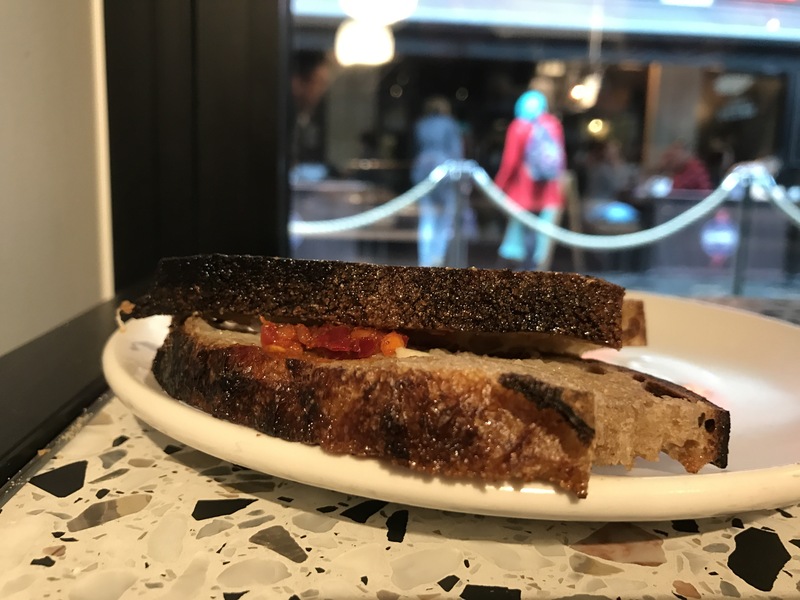 Cheese toastie aside, we had an enjoyable lunch at Pastaio, even if it’s not the earth shattering moment of pasta perfection we longed for. It’s destined to be a success, with long queues in Soho a certainty once word gets around. Me, I’ll be patiently waiting for the potato ravioli and gravy before I consider joining the back of it. I first tried to eat at Sketch three and a half years ago when I impeccably timed my reservation at their two star restaurant with being mowed down by a car outside my home. I recall the doctor visiting in my pen, me in a temporary cast up past my knee, to inform me I had broken nine bones and would be spending more time than I would have liked at hospital. I asked if in his opinion I would be fine to travel to London in less than two weeks to eat at a restaurant. He laughed in my face. Still undeterred, I contact Sketch and ask their opinion. “Sir”, a heavily French accented lady would answer, “we have no lifts but our staff can assist you up the staircase to the restaurant”. I decide against it and instead book another restaurant in Birmingham where pain would cause me to pass out at the table mid-starter. In hindsight cancelling Sketch was probably the correct thing to do. Since then I’ve visited on numerous occasions for very expensive cocktails, but never to eat. Until this time, when finally, after three years of waiting, I bypass the coloured stairs that take you up to the two stair restaurant and turn right into the gallery for afternoon tea. 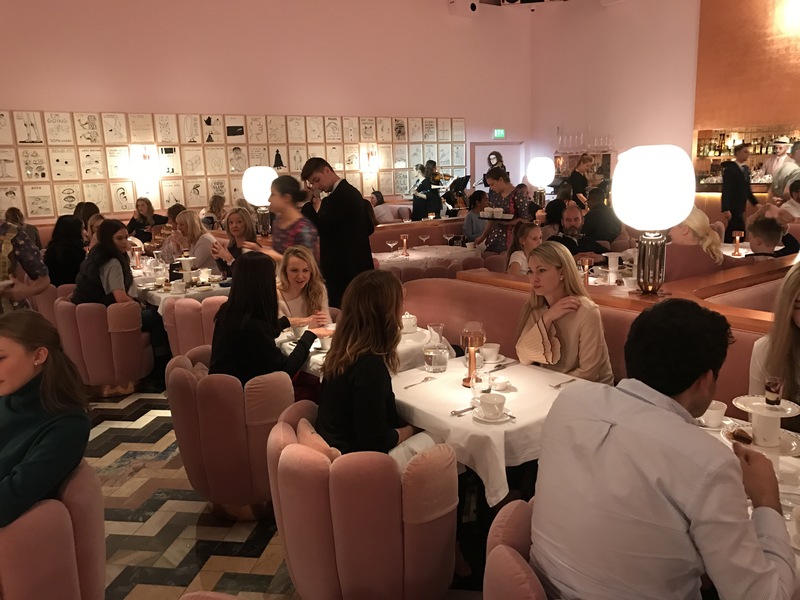 That’s me, a thirty-five year heterosexual male, having afternoon tea in a room that is decorated entirely in baby pink. Where has my life gone wrong, please, someone tell me. 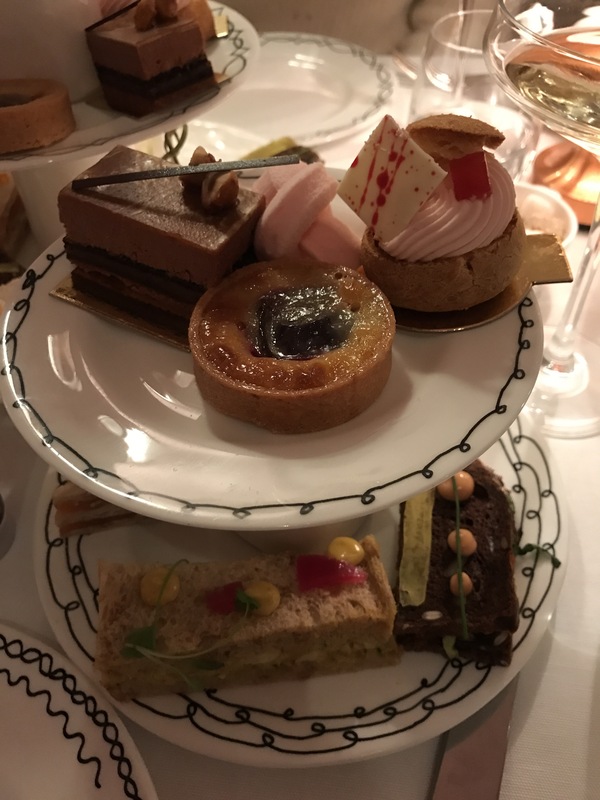 I wasn’t going to write about it, but when said afternoon tea comes in at £85 per head once service has been applied, I’m going to tell you all about it. First the ambience, which Micky Flannigan was entirely correct in saying is a French word for a room too stuffy for poor people to afford. The room rammed with ladies of the world whose figures would dictate that they prioritise being seen over being fed, each with foreign accents and expensive handbags. I love it here. Champagne is poured from a great height and we are told that tea will be served in four courses. Little porcelain egg shells hold a comte mousse and confit quail egg yolk. It’s rich with plenty of cheese flavour. On the side is a little mother of pearl spoon filled with salty caviar because we are in Mayfair, Darhlin’. It’s as decadent a start as one could wish for. We get tea – of course we do, silly – the pots fighting for room on an already bulging table. Then the main event arrives; a stack of plates; sandwiches at the bottom, sweet stuff above. From the sandwiches I swerve the smoked salmon because the stuff makes me gag, instead throwing myself into a rich duck egg mayonnaise and watercress, topped with a fried quails egg. There is pumpernickel bread with tomato and lettuce and the best coronation chicken I have ever eaten. I joke that I could eat another plate of these. Another plate appears. They get eaten. The sweets are all works of precision, from which we like the blueberry cheesecake least and a bubble-gum marshmallow that disappears all too quickly. A delicate plum tart has the kind of short pastry that Mary Berry would approve of, whilst a square of chocolate and caramel is ethereally light and addictive. Top billing is saved for a glorious choux bun with a generous measure of redcurrant cream, as good as pastry I have tried. This being afternoon tea we got scones and jam and not enough clotted cream, all of which I neglect for more coronation chicken. 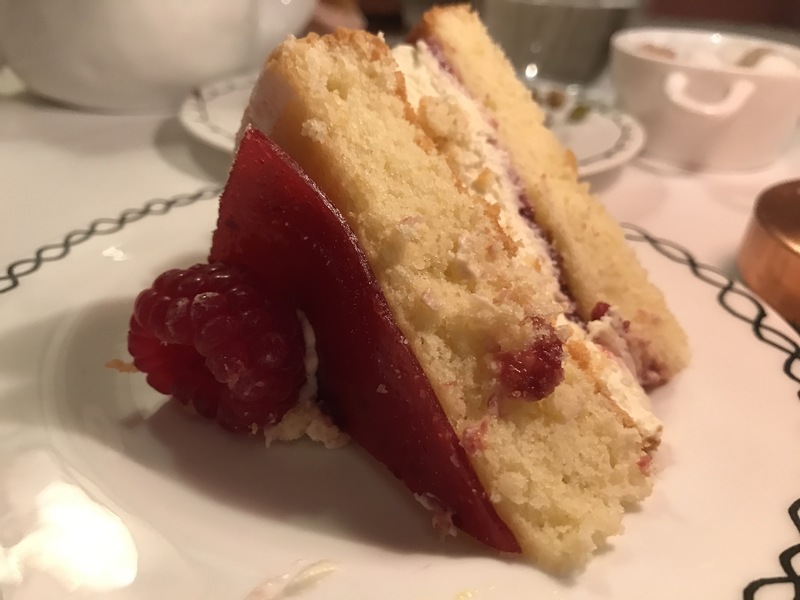 I sit, shirt bulging, with the top button of my trousers loosened, stating that I couldn’t possibly eat a thing more when we are offered a fat slice of Victoria sponge. It’s delicious but too much. So what is apparent is that £85 buys you a lot of afternoon tea. So much so that we struggle to move those arses of ours down the road to The Blind Pig for more cocktails. Looking back now it’s clear that I enjoyed it, partly because the company I kept was great and partly because it’s a polished affair with nice food. But would I do it again? Probably not. I just don’t think I’m an afternoon tea kinda guy and I’d much rather take that sum of cash elsewhere for a more serious bit of cooking. Like upstairs. Yes, next time I visit Sketch I’ll finally get up those stairs and into that two star restaurant. Unbroken and unassisted. Kiln is not for the faint hearted. It is a restaurant with fire at it’s core. Heat blazes from the clay kiln pots that are used to cook with here, and pop up from the dishes studded with chilli. From the raised seating around the food counter it whacks you direct to face like the first steps off the plane on a summer holiday abroad. It is the remover of clothing, the bead of sweat inducing exhilarating reason that we love obsess over fire. A meal here is not only an insight into the food of North Thailand, it is a celebration of heat and the results it brings with control and skill. To see it in action is part of the theatre. With electricity reserved only for lighting and refrigeration, all the graft is done by the small team over smouldering bits of clay. We are handed a menu from which we choose something from every section. We like the smaller dishes most, the pick being a coarsely ground sausage that packed the biggest of chilli hits. Chunks of aged lamb are skewered and fused only by the melted ribbons of fat. These are delicious, as are the chicken thigh glazed in soy in cooked gently through. It is the most solid of starts. From the fish section comes langoustines, cured in lime and hardly cooked so that the flesh is still semi-translucent. It never loses the essence of the shellfish despite the big flavours of holy basil and chilli with every mouthful. It’s delicate yet punchy, and one of the very best langoustine dishes I have ever eaten. We are told that the baked noodle dishes are something of a signature here, so we order them off the back of that. They prove to be the lunches weak point, the crab lost amongst the sour dressing that you work into the dish yourself, the pig unctuous but equally unremarkable. It’s nice enough, but for me not up to the same standard as everything else we eat. We finish up with a beef cheek curry, the texture of the cut of meat similar to how I’ve eaten it in the far east, which is a much quicker cook and firmer texture than the long braising treatment we often give it on these shores. It divides us; I really like the depth of flavour, complex with anise, galangal, and clove, my dining companion less so. I finish the bowl off happily, teasing the last of the sauce out with wild rice that still has a little bit to it. The bill for all of this with a cocktail and glass of wine comes in at a shade over seventy quid, good value, we both agree. Kiln is simply a one-off; a sneaky peek into the cuisine for a part of a country not associated with voyeurism like it’s southern half. It’s a thrilling experience, equally for the punchy style of cooking and theatre. It’s vibrant and in your face, and worthy of anyone building a sweat up for. 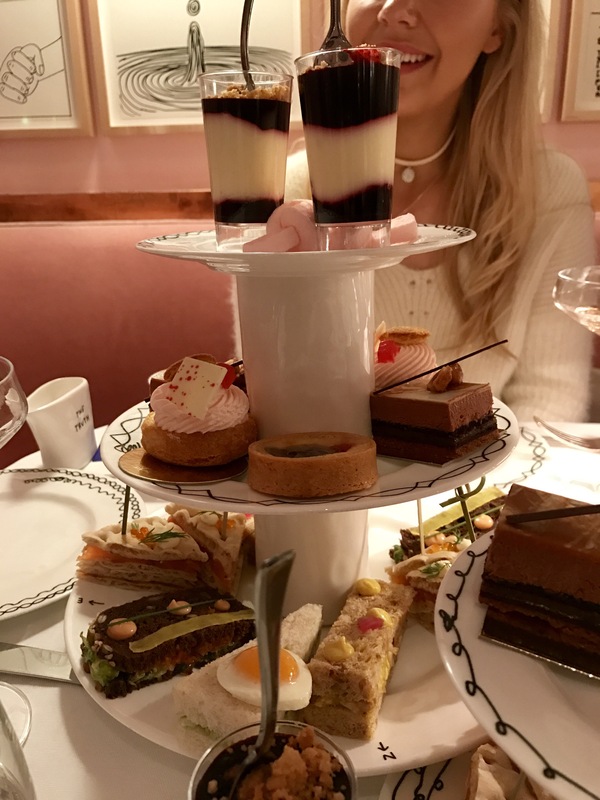 The promenade of The Dorchester hotel is full of those having afternoon tea. It is a curious mix of ladies who lunch, those celebrating, and hotel guests. The class and the crass, if you like. There are pearls and gowns beside velour tracksuits. Cut glass English accents are interspersed by shouty American ones. It is a lovely space where new money meets old money with a shared interest in the most luxurious of hotels. We walk through that promenade and turn left into the dining room of Alain Ducasse at The Dorchester. It is bigger than I expected, with washed grey walls, immaculate white linen, deep chairs, and an army of staff. The latter are everywhere, an orchestra of tailored suits and foreign accents who are trained into pouring wine simultaneously and expertly covering up stains with smaller sheets of linen. Each are aware of their individual roles in us leaving replete and suitably poorer than when we left. After turning down the attention of a champagne trolley we are presented with a generous pyramid of gougeres – those lovely savoury choux buns flavoured with cheese. These are nice, a little light on the emmental cheese flavour, and not as good as those at Ramsay at Royal Hospital Road (an obvious comparison given it is London’s only other 3*). The less said about the amouse bouche the better – a curious blend of cured John Dory, lime and peanut that was never going to work. If 2017 serves up a more ill-conceived dish I shall be very unfortunate. We tried much of the bread to mostly great success. 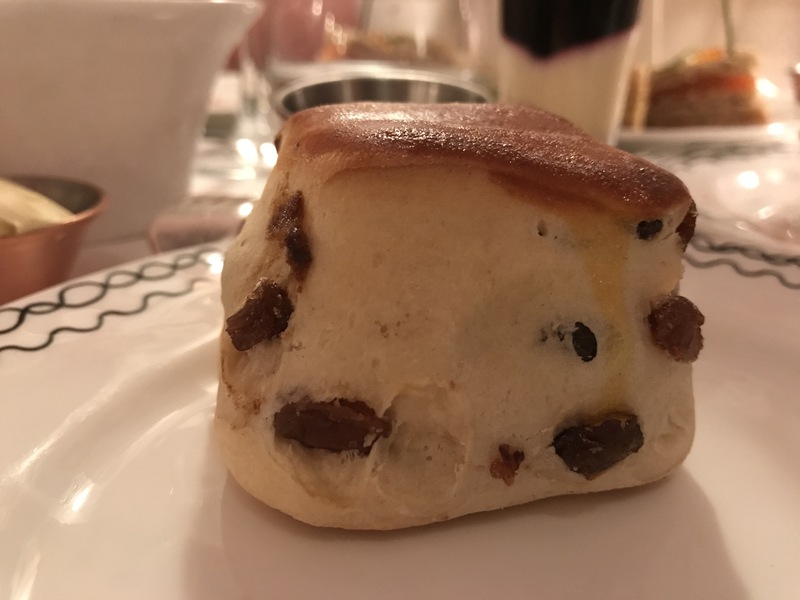 A farmhouse bun was as light as a pillow and delicate with the back note of pork lard, whereas a black olive was a little muted on flavour. Best was a bacon fogasse that had us going back for seconds, thirds, and, in my case, fourths. Who said not to overfill on the bread course has never eaten this. It’s the ultimate breakfast of knotted bread and cubes of fatty bacon. We smear it inch thick with a lovely salted butter that has been shaped into an onion, whilst sneering at the aerated cream cheese option that looks and tastes like hair mousse. Our first course hit the mark. A crumbed egg gave way to the brightest of yolks that served as a sauce for the smoked corn, chicken oysters and onion stuffed with chicken mousseline. A corn tuile was a superfluous addition that the dish did not need, but the rest was indulgent and cohesive. And then, well, it all slumped for a while during mains. A lamb rump was perfectly cooked, seasoned, and rested, with chickpeas, a hummus like puree and pickled onions. It was nice. In the same way that Songs of Praise is nice, or making daisy chains. Impossible to fault, but equally hard to get excited over. The thrill of dining here is lost amongst the fear of being anything other than perfect, as if the weight of Michelin hangs more heavily here than anywhere else I have dined at it in the country. There are no risks being taken. A word on the sauce though, it was an incredible thing that only a classic French approach can result in. The other main was a technically astute squid stuffed pasta, with various preparations of octopus hidden under a canopy of leaves. The overriding flavour is one of citrus that lifts and occasional dominates all it coats. The octopus was tender, the pasta silky, but three stars? Really? It’s all far too safe. You get the mignardises here before dessert, why I simply could not tell you. 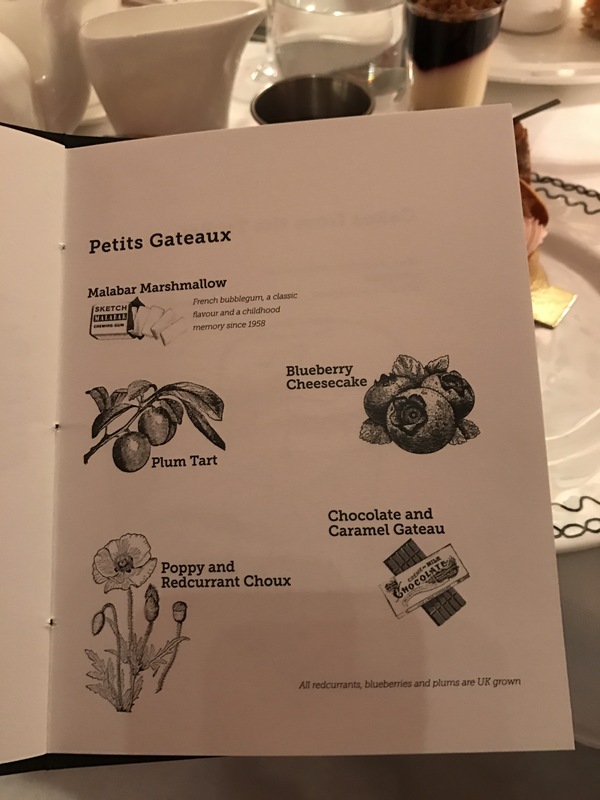 What I can tell you is that they are all delicious, with some of the best macaroons I have eaten, cocoa coated almonds, nougat, and chocolates. A lot of work goes into these and it pays off, with a salted caramel toffee disappearing to a nothing on the tongue. Really lovely stuff. Desserts were true three star calibre. An almond sponge has the lightest of textures, with poached apricot’s and almond granita. Like the savoury courses there is nothing to fault but this has character; it stands up and demands attention. Before I move onto my dessert, we were given an additional course because we were celebrating. Its strawberries and cream for the child at heart, one perfect quenelle of milk ice cream, another of strawberry. Little meringues of raspberry provide texture, with a singular fruit crowning it all. The depth of the ice creams are truly staggering. There is obvious skill in this part of the kitchen. The best course of the lunch deserves a post of it’s own, but I have a liver to kill and only limited time to do so, so you’ll have to make do with this paragraph. Chocolate and passion fruit. It sounds simple enough. Wrong. Two tempered chocolate domes, one filled with a white chocolate mousse, the other a passion fruit mousse and topped with passion fruit seeds so that it resembles a halved fruit. Have a look for yourself. I couldn’t believe it as I cracked into it and I was 30cm away. More chocolate as a creme, tuile, and crispy covered puffed rice. Central to this was a vivid passion fruit ice cream that perfectly balanced it all out. I’m not a dessert man because they are too often an afterthought, but this is up there with the very best sweet courses I have ever had. We finish with coffee and a tea trolley where you choose your own plant for an infusion. It’s a lovely concept, typical of a place where every thought has been considered for the consumer. Apart from the food that is. See, my biggest problem with Ducasse is a simple one: Exactly one week one after dining here I have to refer to notes to remember much of what we ate. I remember the splendid company and wonderful service. I remember how charming the restaurant manager was. I remember that the desserts were unquestionably three star level. But the savoury stuff was mostly forgettable safe cooking, hovering around the two star level if they were lucky. It’s nice. But then nice just doesn’t cut it when this sort of money and reputation is involved. Bleecker Burger almost never happened. It was the last entry on our itinerary for the weekend, after the three star and the trendy Thai place and shite patisserie, only making the cut because it was close to our hotel in Victoria and we needed somewhere to go for breakfast. Which, yes, it does qualify as on account of it being some meat in a bun. And, despite its late inclusion, when we where sat on the train home discussing the three star and the trendy Thai and shite patisserie, we both agreed that the best thing we ate came the black fronted, yellow chaired, spot near Victoria station. Where bits of aged beef mince are compacted and cooked to medium rare, held together by a bun that stays in working order. We try two burgers. A Blue Burger has the patty in a blue cheese sauce that whacks with umami. Its good, very good even, but it pales in comparison to the Bacon Cheeseburger that allows the quality of the beef to shine with just a little American cheese, a rasher of crisp bacon and white onion. It is stunning. As much as I love Original Patty Man back home, this is as good, if not better. Even with another lunch planned in less than three hours I am sent back inside for another for us to share. Our later lunch is worth jeopardising for this. The Angry Fries divide us, but this is my turf so let me tell you that the mixture of blue cheese and hot sauces is an inspired one, one cooling the other, full of umami and funk. The other half thinks that they detract from the spud but she watches Keeping Up With The Kardashians, so read into her opinion as you want. And there you go, maybe the best twenty-six quid I have spent in a while, overshadowing some very serious food had throughout the rest of our weekend. But it’s created a quandary of it’s own – my five or six trips to London a year are to eat new food, not return to the same places, yet it will be impossible to not have a Bleecker whenever we come back. I thank the chef on our way out, telling her that it was probably the best burger I have eaten. She smiles and thanks me in a way that makes me think she has answered to that on many an occasion before. I can believe it. The burgers here are the real deal, as good as any you are ever likely to eat.